Never be tethered to a power outlet again. The Go Urban cargo pant by Silvr Lining includes a pair of built-in photovoltaic panels, so you can keep your cellphone juiced wherever you roam without scrambling for an electrical source. Composed of animal-friendly Ultrasuede, the low-slung drawstring trouser is lightweight, water-resistant, stain-repellent, and tough as nails. In addition to two easy-access side pockets (each holds an independently functioning power supply) and two button-down back pockets, the cargo pant includes a Tagua nut button above the fly as a finishing touch. Never be tethered to a power outlet again. 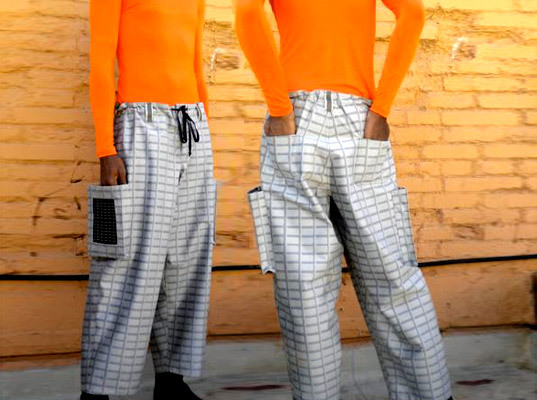 The Go Urban cargo pant by�Silvr Lining includes a pair of built-in photovoltaic panels, so you can keep your cellphone juiced wherever you roam without scrambling for an electrical source. Composed of animal-friendly Ultrasuede, the low-slung drawstring trouser is lightweight, water-resistant, stain-repellent, and tough as nails. In addition to two easy-access side pockets (each holds an independently functioning power supply) and two button-down back pockets, the cargo pant includes a Tagua nut button above the fly as a finishing touch.